Zibatmiņa 8GB USB 2.0, Yum Yum, ECMMD8GSW101, violetā kr. 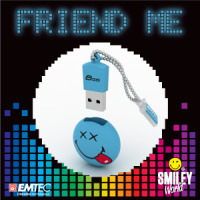 Features Exclusive EMTEC 3D design Made out of soft touch rubber material Available in 8GB Tip: Do not lose the Smiley face anymore thanks to the cap holder and small chain. Zibatmiņa 8GB USB 2.0, Shame, ECMMD8GSW102, sarkanā kr. Zibatmiņa 8GB USB 2.0, Happy Days, ECMMD8GSW103, zilā kr.